Carers Rights Day in November was marked with a new hospital tea and chat service which has got off to a flying start. Since it’s launch more than 500 people have been given information about the support available for carers in Dudley borough. 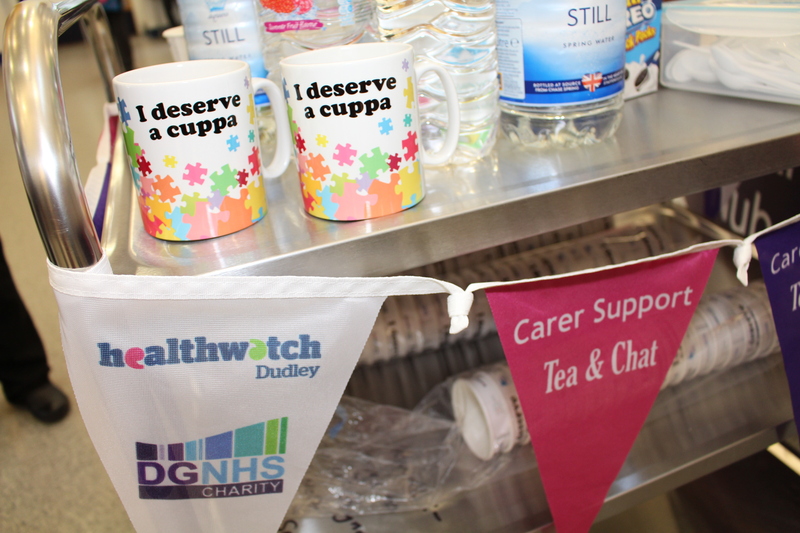 ‘Tea and Chat’ was set up by Dudley CVS and hospital Carer Coordinator Sharon McGlynn with the support of Healthwatch Dudley, in a bid to identify hidden carers. Hidden carers are people who care for a relative, friend or a loved one but don’t receive any help or support. The service is available one afternoon each week on the wards of Russells Hall Hospital at during visiting times between 2pm & 4pm. 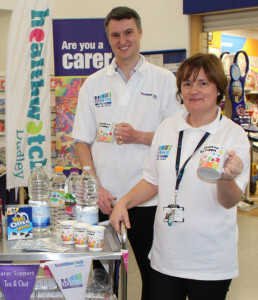 Trained Healthwatch Dudley and hospital volunteers offer patients and their visitors a warm drink, a friendly chat and the chance to find out more about the help, support or benefits that carers can tap into. The free service is part of the Dudley Group of Hospitals NHS Trust charity and is funded entirely through donations. Sainsbury’s supermarket in Merry Hill initially backed the service by providing a tea trolley and refreshments. Sharon McGlynn said, “Often people don’t realise that they have become a carer so miss out on the support that’s out there. Offering people a cup of tea and having a chat is a very easy way to share important information. We have now visited most in patient areas and will continue to do so as have received such a positive response from patients, their relatives, staff and from our volunteers who are enjoying making such a big difference”. Our Chief Officer Jayne Emery added, “Carers are a big priority for Healthwatch Dudley and we have also got an important information giving role, so are delighted to support this great initiative. Our volunteers are really enjoying being involved and looking forward, this will be a helpful way for us to listen to and gather the experiences of local people accessing services at Russells Hall Hospital”. Sharon McGlynn can be contacted on 01384 573381/ 07435 754386 or email carers@dudleycvs.org.uk for more information. 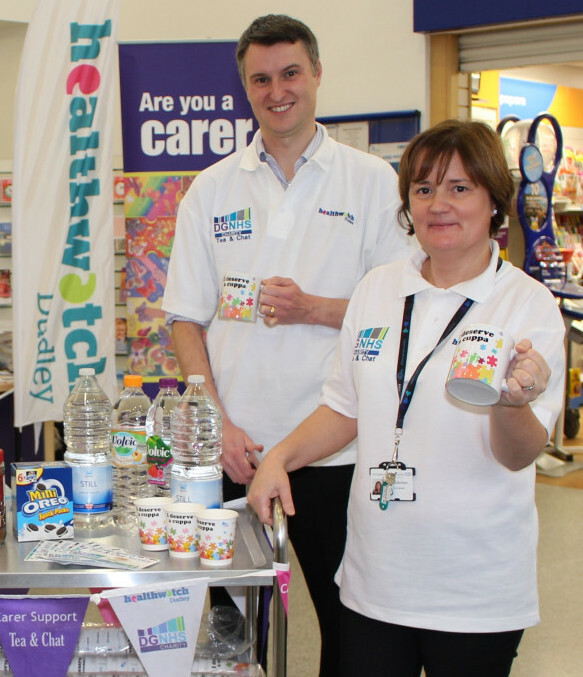 This entry was posted in Uncategorized and tagged Carers, Dudley CVS, Dudley Group of Hospitals, information, Russells Hall Hospital, Support, your experience on November 28, 2014 by Healthwatch Dudley. England’s Chief Inspector of Hospitals is inviting members of the public to tell his inspection panel what they think of the services provided by The Dudley Group NHS Foundation Trust. Their views and experiences will help inspectors decide what to look at when they inspect the trust. The trust is among the first to be inspected and given an overall rating under radical changes which have been introduced by the Care Quality Commission (CQC). The formal inspection of The Dudley Group NHS Foundation Trust will start on 25 March 2014. To ensure the views of patients and the local community are properly heard, the inspectors will be holding two listening events, both at 6.30pm on Tuesday 25 March. The events will be held at Dudley Town Hall, Dudley and The Talbot Hotel in Stourbridge. This entry was posted in Uncategorized and tagged community, consumer champion, CQC, discussion, Dudley Group of Hospitals, experiences, inspect, local voice, trust, views on March 6, 2014 by Healthwatch Dudley.